Microsoft has released Windows 10 Creators Update and if you want to get your hands on the latest version of the operating system you can now download the ISO files straight from the software giant's website. Microsoft has a dedicated landing page for Windows 10 ISO files, which lets you download both the 32-bit and 64-bit Windows 10 Creators Update, Windows 10 Creators Update N and Windows 10 Creators Update Single Language ISO files without messing around with the Media Creation Tool. However, if you click that link from a Windows device you will be redirected to the Media Creation Tool page. That's a bummer, but you can easily avoid that. Here's how. 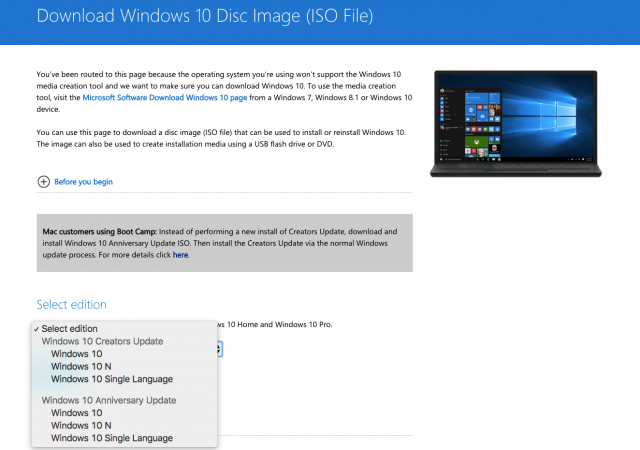 Microsoft has created the Windows 10 ISO files page so that folks who don't have a Windows device, and therefore can't use the Media Creation Tool, can still get Windows 10 Anniversary Update and Windows 10 Creators Update ISO files. But, strangely enough, it has decided that Windows users shouldn't be able to access it as well. So if it reads the user agent of the browser and sees that you are accessing the page from a Windows device, you will get that redirect. Fortunately, it is easy to change the user agent so that the browser identifies your Windows PC as, say, an Android device. With Google Chrome, Google actually provides an extension, called User-Agent Switcher, which lets you change the user agent on the fly. If you have a different browser, there are also similar extensions available for Mozilla Firefox. You can do that in Microsoft Edge too, from the Emulation tab in Developer Tools. Press F12 to access it. After you install the extension or configure your browser to report a different user agent, you may have to restart it for the change to take effect. But, after that's done, you will be able to access the Windows 10 ISO files page and download the Windows 10 Creators Update files directly from Microsoft's website.